The book arts are broad in scope. 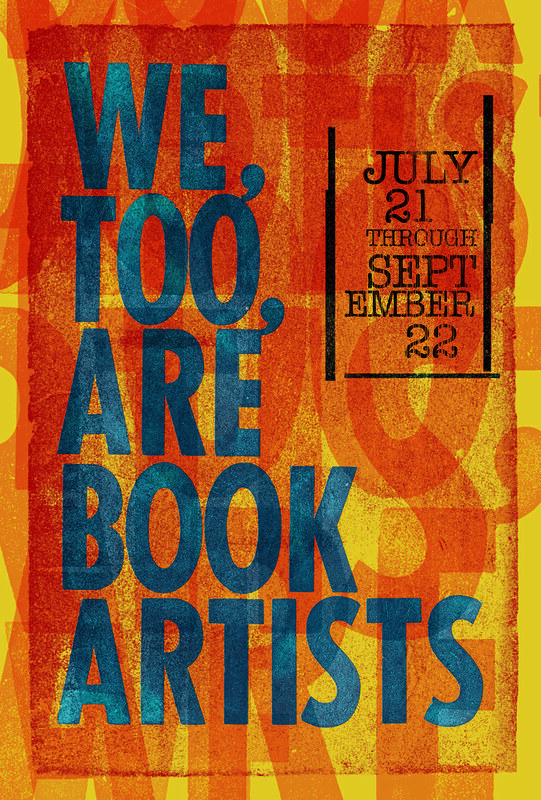 A variety of media, from printmaking to sculpture, can be used as communication tools often challenging traditional definitions of “book.” This breadth also extends to the artists who create artists’ books. For many, books represent just one method for the expression of ideas. As boundaries between disciplines such as painting, textiles, performance and printmaking begin to merge and blur, exciting work incorporating book-like elements develops. 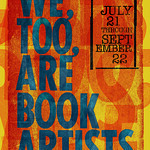 We, Too, Are Book Artists brings these varied, international perspectives to a single venue. “I am interested in politics as it relates to the interactions of people living together in society – specifically in our identities as racial and cultural groups. 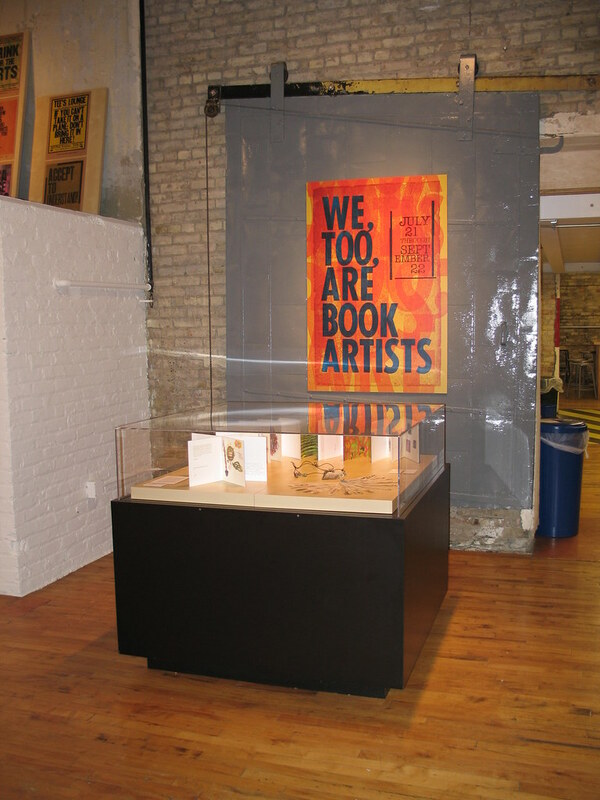 Through hand-printed books, broadsides and interactive installations I attempt to re-present the implicit and often explicit notions of race and culture that are deeply rooted in American society. 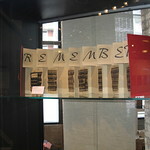 For over 25 years, John Crombie, typographer and proprietor of Kickshaws Press in Paris, France has been keeping up the tradition of the early expatriate presses, producing a unique range of work – including interactive books, children’s books, puzzle books and mobiles. The term “kickshaws” a corruption of the French word quelque chose (“something”), was used by the English in the seventeenth century to reference the culinary whims of the French. The word also can suggest elegance, and refer to games, frivolous pastimes, and nonsense. Crombie has been influenced by discoveries made in the course of his letterpress career and the accidental effects and incidental revelations of setting, inking and impressing type. Neither..Nor… was printed in an edition of sixty, yet each copy is unique. Printing required four complete, separate runs through the press (not counting the text), the inks being applied by hand at each pass to allow them to blend at random, from the first streaks of primary colors to the ultimate dissolution of the images generated. In Parenthesis was printed in lavish, bright colors and borrows text from Samuel Beckett’s Waiting for Godot. Characteristic of Crombie’s work, both demonstrate substance and complexity in the guise of self-dismissal. Each passes as a trifle while displaying the elements of clever construction and design. Ruth E. Edwards, a native New Yorker, is the Founder of “Books In Black” and curator for its exhibits. 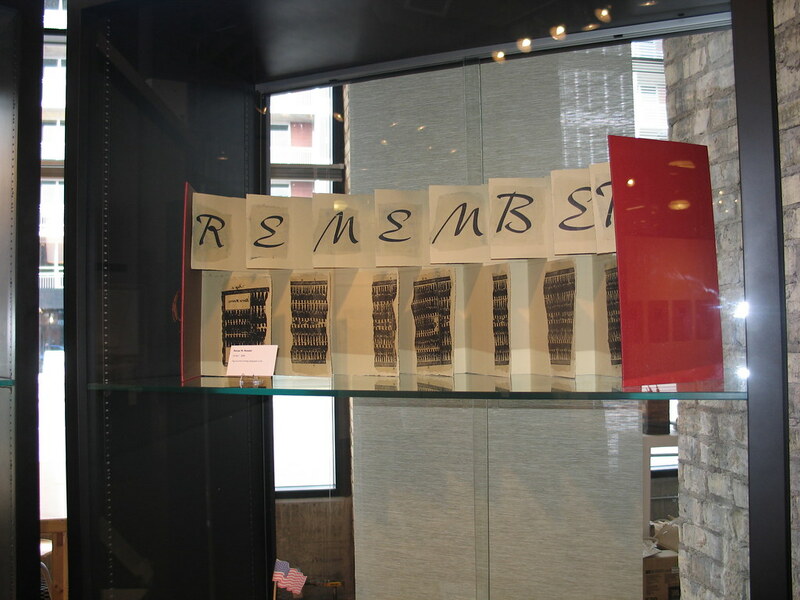 The collective creates and exhibits sculptural artists’ books that pay tribute to individuals of African ancestry who through their inventions and endeavors made monumental contributions to the landscape of society. Edwards is a book artist and an instructor on a mission to have every child in every classroom make books. In recent years, working with internationally known artist/illustrator Tom Feelings, Ruth has designed four artists’ books using his drawings. Edwards is the recipient of a grant from the New York State Council on the Arts and her books may be found in collections across the United States, Brazil, and Thailand. Born in Providence, Rhode Island, Ellen Gallagher now lives and works in New York and Rotterdam, Holland. Although her work has often been interpreted strictly as an examination of race, Gallagher also suggests a more formal reading with respect to materials, processes, repetition, and revision. Murmur consists of five individually bound and handmade volumes (Blizzard of White, Superboo, Monster, Orbus, and Watery Ecstatic), held together by hidden magnets. Four volumes present film stills created in collaboration with Dutch artist Edgar Cleijne. They combine Gallagher’s oceanic imagery with reworked and scratched footage from vintage science-fiction films. Orbus is a collection of Gallagher’s watercolor, ink, and plasticine collages on paper. Using a serene and imaginative approach to African American identity and fluid images of strange sea creatures, Murmur transports the viewer to Drexciya, a utopian underwater world inhabited by women and children who escaped from slave ships on the horrifying journey from Africa to America. Born in Oklahoma City, Oklahoma and raised in Paris, Texas, Trenton Doyle Hancock earned his BFA from Texas A&M University, Commerce and his MFA from the Tyler School of Art at Temple University, Philadelphia. Hancock’s prints, drawings, and collaged felt paintings work together to tell the story of the Mounds ¬– a group of mythical creatures that are the tragic protagonists of the artist’s unfolding narrative. Each new work by Hancock is a contribution to the saga of the Mounds, portraying the birth, life, death, afterlife, and even dream states of these half-animal, half-plant creatures. The book Me a Mound is his first monograph and storybook. Influenced by the history of painting, especially Abstract Expressionism, Hancock transforms traditionally formal decisions – such as the use of color, language, and pattern – into opportunities to create new characters, develop sub-plots, and convey symbolic meaning through the reworking of Biblical stories he learned as a child. Hancock was featured in the 2000 and 2002 Whitney Biennial exhibitions, becoming one of the youngest artists in history to participate in this prestigious survey. Suzanne Jackson is a Professor of Painting at the Savannah College of Art and Design and her works can be found in public and private collections throughout the nation, including the Indianapolis Museum of Art; the Adam Clayton Powell Jr. State Office Building, New York; the Museum of African American Art, Los Angeles; the Palm Springs Desert Museum; and the Savannah College of Art and Design Jen Library. Philip Mallory Jones has worked with video, film and photography since 1969, and has incorporated digital media since 1990. His work has been broadcast and presented throughout North America, the Caribbean, South America, Europe, Africa, Japan and Australia. He was co-founder and Director of Ithaca Video Projects (1971-84), one of the pioneering media arts centers and Director/Curator of the Annual Ithaca Video Festival (1975-84), the first touring collection of video art. Jones was Batza Chair in Art and Art History at Colgate University in 2002 and Artist-In-Residence at the Institute for Studies in the Arts, at Arizona State University from 1991-2000. Bert L. Long Jr., a native and resident of Houston, Texas, was awarded a Prix de Rome in 1990 and his book Mental Asylum offers a richly illustrated “diary” of his year at The American Academy in Rome. The book presents Rome’s history, the city today, its graffiti, its history of collecting art through the centuries and Long’s words of wisdom. A native of Philadelphia, Morgan lives and works in Minneapolis, Minnesota, and is the chair of the Department of Art at the University of Minnesota. Sketchbooks, a limited edition book combining Iris printing (fine art inkjet printing) and letterpress, examines the creative process and explores the nature of abstraction as an art practice. “Cognition, exploration, seduction, context and aesthetics are integral parts in my creative process. My work is a product of my thoughts, feelings, impressions, experiences and expressions of what may affect us all. Using racism, sexism, oppression, exploitation and any ideology that I find compelling and interesting, I rely on my personal experiences to lead me to a question that may or may not be answered. Through personal exploration, collage, repetition, various printmaking media and photography, I present my work in ways that connect with viewers’ thoughts and emotions. 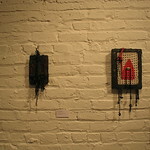 Shimoda is a mixed-media artist living in Harlem, New York. Influenced by a variety of cultures, her work strongly connects people with nature. Beads, bone, shells, semi-precious stones and fabrics are all chosen for their powers to uplift the human spirit. Shimoda is a founding member of the New York Bead Society and is an active member of “Books in Black,” the Harlem Arts Alliance and the Textile Study Group of New York. 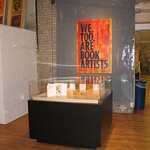 Her love of handmade paper expanded through a recent grant with The Center for Book Arts in New York. 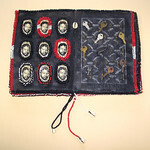 In addition to artists’ books, Shimoda is known for her line of unique fashion accessories, sold at New York’s Museum of Natural History, the American Craft Museum, Macy’s, and galleries in California, Washington D.C. and Detroit. Her work has adorned a variety of creative individuals, including Queen Latifa, Halle Berry, Whitney Houston, Cassandra Wilson, Kim Coles, Vernon Reid, Angela Bassett, Ben Kingsley, and Naomi Campbell. Set in the year 2194, in which the artist supposes the complete extinction of African Americans, Danny, The Last African American in the 22nd Century presents an anthropological excavation of 19th and 20th century African American urban culture. 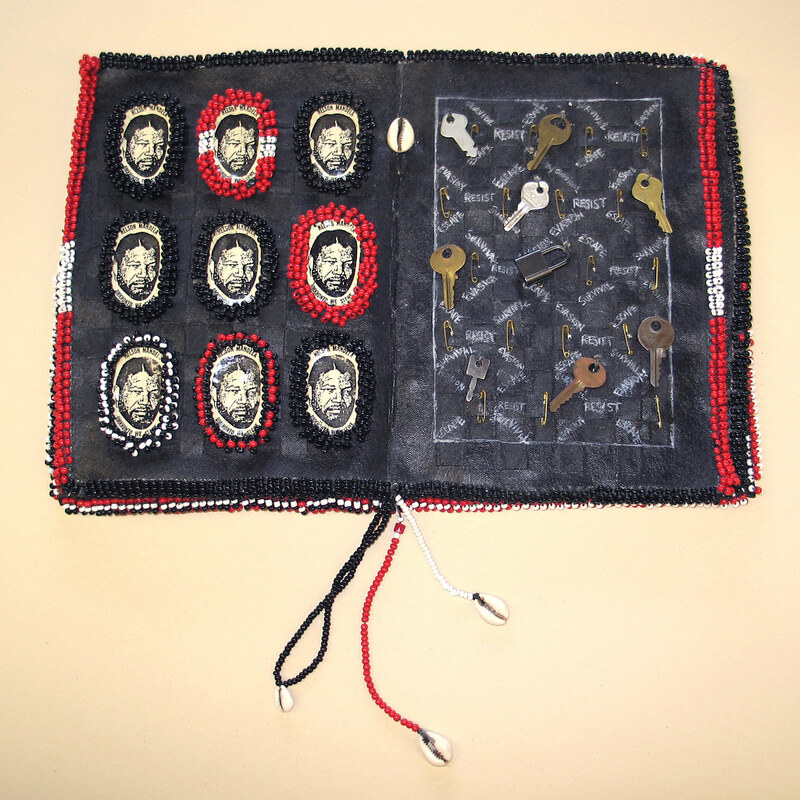 Both an artists’ book and a document of Tisdale’s acclaimed performance “The Last African-American,” this work explores issues of ethnicity, racial stereotyping and cultural mores through the eyes and voice of one man who along with others has been truly objectified. Kara Walker is best known for exploring the raw intersection of race, gender, and sexuality through her iconic, silhouetted figures. Walker unleashes the traditionally proper Victorian medium of the silhouette directly onto the walls of galleries, creating theatrical spaces in which her unruly cut-paper characters fornicate and inflict violence on one another. Kara Walker: The Renaissance Society expands beyond Walker’s well-recognized aesthetic to include watercolor drawings, photocopies and a threatening tirade rendered on an antiquated typewriter. Through copious writings, Walker offers artist’s statements, fictional sketches, psychotic rants, vignettes and prose in a fragmentary collection of little events. In the course of her photographic career, Carrie Mae Weems has created a rich array of documentary series, still lives, narrative tableaux, and installation works. 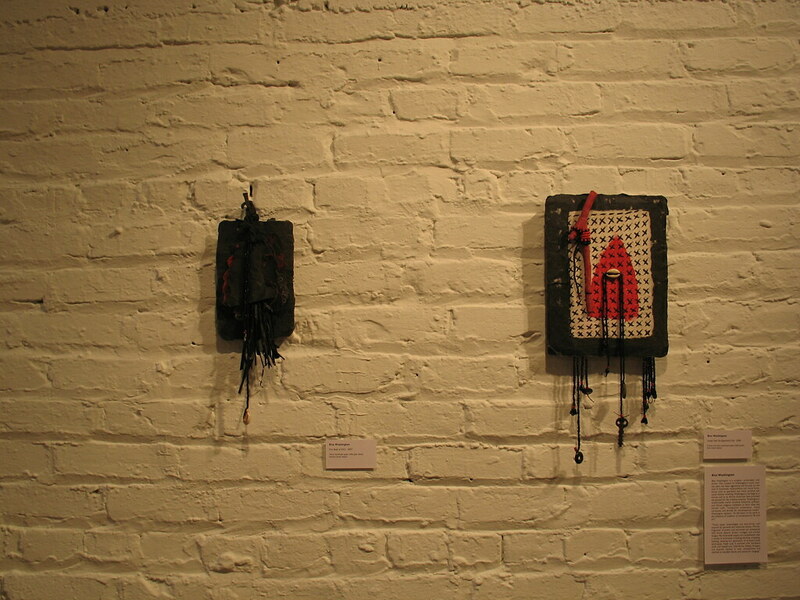 Her art balances rich and universal themes with the specifics of personal, cultural, national, and world histories. Often mixing hard realities with a personal vision, some works are pointedly political, bitter with the pain of past injustices and still prevalent prejudices, while other work is playful and even celebratory. In Kitchen Table Series, Weems creates a visual narrative that expands her perspective from the personal (her family’s experiences) and the political (racism) to broader issues of gender relations, individual identity, and parenting. In addition to her work at the Art Institute of Chicago, Webster works in the paper studios at Columbia College Center for Book and Paper Arts and teaches plant fiber papermaking at Columbia College, The Oak Park Conservatory and the Paper Studio in Tempe, Arizona. A man with his feet planted firmly in the past, Amos Kennedy is a letterpress printer, papermaker and self-proclaimed “book builder” dedicated to the documentation of African American culture. His work embodies his passion for stirring up strong emotions and encouraging people to think in previously unexplored ways. 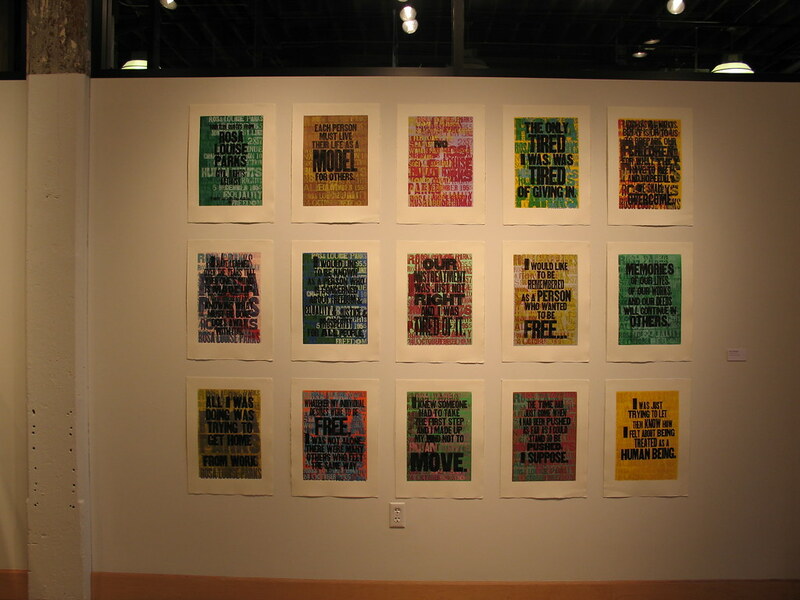 Through the use of the book form, posters, postcards, and other printed media, Kennedy’s work delivers powerful messages about topics such as the vulnerability of children, his African heritage, and community activism. Kennedy studied at Grambling State University in Louisiana, and received his MFA from the University of Wisconsin at Madison. A trip to the Williamsburg, Virginia, print shop in 1980 cemented his desire to become a professional printer. From Williamsburg, he traveled north to Chicago, where he joined Artists Book Works and bought his first press. 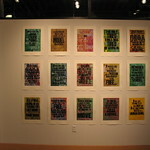 In addition to his work as a book artist, Kennedy is an educator, performance artist and proprietor of Kennedy Prints! a letterpress print studio in Akron, Alabama. Most recently, he was awarded the Barbara Bishop Endowed Chair at Longwood University in Farmville, Virginia.